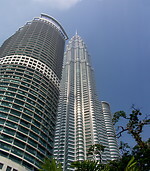 The Petronas Twin Towers in Kuala Lumpur, named after the Malaysian Petronas industrial group, were the world's tallest building between 1998 and 2004. The towers were designed by Cesar Pelli and built between 1992 and 1998. The towers have 88 floors and reach a height of 452m (top of antenna spire) and 410m (highest roof). 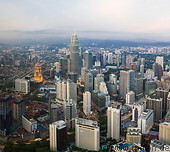 Below the towers is Suria KLCC, a high end shopping mall.